Gifford became Deputy District Grand Master of the English Constitution in New Zealand. There are few men who could live up to such a tribute, yet one who could comfortably exist within such strict boundaries of justness and uprightness was a member of Lodge St. Patrick, and his Lodge was proud of him. So modest though was he that, only during the many tributes paid at his funeral, did a considerable number of his colleagues, and even some of his friends, learn of the immense depth of his numerable achievements. 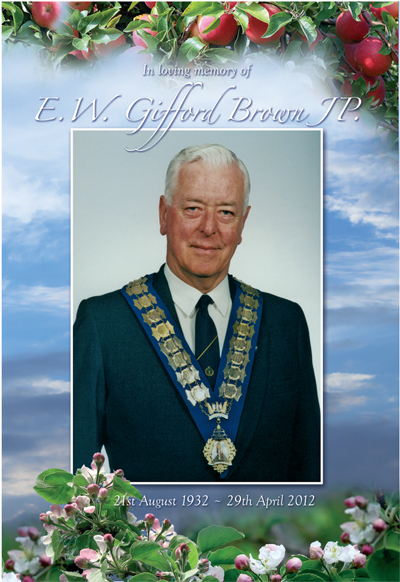 Gifford Brown was introduced to Freemasonry in 1963. He and his wife, Shirley, owned an apple orchard in Beaumont (a village deep in the south of the South Island of New Zealand) and from here he joined Lodge St. George, an English Constitution lodge, that held its meetings in the picturesque farming town of Lawrence. Gifford was a man of bearing, he possessed a powerful presence, and within a brief span he had become a noted member, rising steadily through the ranks to eventually become the Master of the Lodge. 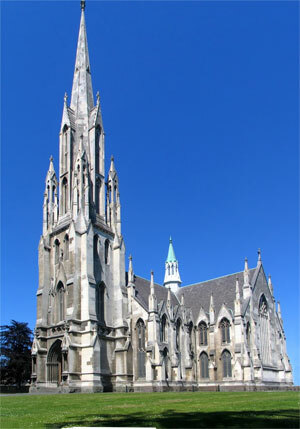 Dunedin's First Church was the site of a new beginning for the Brown family. The lives of the Brown family were very nearly extinguished in 1979, when the Humber Super Snipe that Gifford was driving was hit head on by another vehicle. (The other driver was later prosecuted for being intoxicated). Gifford suffered bad facial injuries, while front seat passenger, Shirley, his wife, was catapulted forward so violently that she broke both ankles and her thigh in two places, while her upper torso was flung through the windscreen. She was lucky to be alive. Gifford was in need of a hip replacement and the collision aggravated the condition. In an instant their lives had been turned inside out. As the scars began to heal it was obvious that neither was longer capable of working at their beloved Riverside Orchard and the cold reality had to be to create a new life - but away from the countryside that they so enjoyed. Just as Masonic duties were his passion in Lawrence, they assisted the family’s unexpected new start in Dunedin, helping to create a new circle of friends in the city where, in 1980, Gifford was appointed Church Officer of the magnificent First Church of Otago. He became involved with the three English Constitution lodges then operating - the Lodge of Otago, The Dunedin Lodge and Port Chalmers’ Marine Lodge. Here his interest in Masonic development was aroused, and he joined other Masonic Orders. Firstly the Royal Arch Chapter of Otago, within which he climbed the ranks to become its 1st Principal. He bound himself to the Mark Lodge, rising to become Mark Master and, having come on board the Royal Ark Mariner Lodge, he progressed to become its Commander. His enthusiasm for Freemasonry, his dedication and attention to detail were noted both by District Grand Lodge (where he was eventually appointed Deputy District Grand Master), and the United Grand Lodge of England (based in London), who rewarded his efforts with Grand Rank. In 2006 Gifford joined Lodge St. Patrick and, as was his wont, performed above and beyond the call. To the extent that, in 2011, he was awarded a Provincial Grand Rank within the Irish Constitution. And, as if these achievements were not enough, it was through the Dunedin Rose Croix Chapter (an Order into which he had been initiated in 1977) that he gained his 30th, 31st and 32nd degrees and, eventually, the highest degree it is possible for any Freemason to hold - the coveted 33rd - a rank which few ever attain. Throughout his Masonic career Gifford always found time to speak to, and befriend, all the Masons that he met. It mattered not to him whether they were newly admitted Entered Apprentices or Provincial Grand Masters; all were treated with equal respect, and with friendship and assistance whenever there was a need. No task was ever “too much trouble” for this man. During all of this seemingly endless busyness, one of the precepts of Freemasonry - charity - was never neglected. An active member of the Otago Masonic Charitable Trust, Gifford served on many of its committees, and as its Chairman from 1996 to 1999. He continued his interest in the Trust - even at the time of his demise he was an regular member of two of its committees. 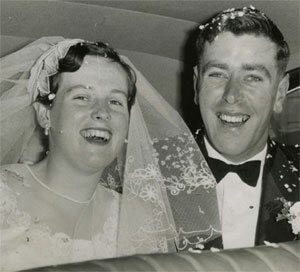 Shirley Pearson and Gifford Brown were married in Beaumont on 26 October 1957 and spent their honeymoon in apple country - (Nelson). Throughout his life Gifford remained keen on outdoor pursuits. Throughout his Masonic career Gifford was faithfully encouraged and supported by his wife, Shirley (nee Pearson). All at Lodge St. Patrick have come to enjoy her sumptuous baking skills (albeit at the expense of our waistlines), and to admire her prowess as a seamstress and embroiderer as, working behind the scenes and always willing to ‘muck in’, she has repaired, altered or refurbished very many items of Masonic regalia - and not to mention her attendance at, and contributions to, innumerable Masonic functions over many years. A friend from Gifford’s time in the army, Reverend John Sinclair, presided over the funeral. Reverend Sinclair spoke of Gifford’s pride in his roots, although born in Balclutha, he reckoned that he got his build from a Highlander, as his ancestors came from the Shetland Islands, a subarctic archipelago in the far north of Scotland - wild country - and this gene pool may have accounted for Gifford’s love of nature’s ‘empty spaces’, as a youth mustering on horseback at Kakanui and all over the Maniototo, and hunting in the surrounding mountains. Tough natural training for any soldier-to-be. How he ever managed to cram all of his various offices into his life will remain a mystery. As another example, in the City of Dunedin, Gifford is better known as being a prominent Justice of the Peace, an Association he entered in 1967. He presided over many criminal cases, small and large, most notably ‘The Bouwer Case’ - Dr. Colin Bouwer was a psychopathic South African psychiatrist, who callously killed his loving spouse. In 2001, Bouwer was found guilty of cruelly murdering his wife by slow poi- soning, and was sentenced to life imprisonment. Gifford Brown held the highest award available in the land from the Justice of the Peace Association. 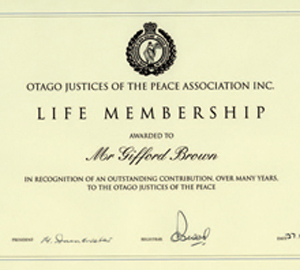 As in Masonry, Gifford Brown rose through the ranks of the New Zealand justice system, serving as President of the Justice of the Peace Association from 1998 to 1999. A long time friend of the family, Sir Robin Gray JP, addressing the congregation at the funeral, spoke of Gifford’s natural ability to be even handed, courteous and polite - to even the most heinous, hardened criminals who, surprisingly, appeared to respond to this basic approach. Gifford Brown would be the first to admit that one talent that did elude him was the ability to sing - all the more extraordinary then that, in 1994, he was elected Vice President of the Royal Dunedin Male Choir! The choir members had met him in 1986, their centenary year, when several of their activities were centred on First Church, and the choir members were immediately impressed by Gifford’s warm and friendly manner in his role as Church Officer. Shirley and Gifford also became ‘subscribers’ to the choir in 1986, and thus began a 25 year association. The choir were delighted when Gifford accepted the office of Vice-President which culminated in him being elected President in 2004. Normally this is a two-year office, but Gifford was so popular and entered so wholeheartedly into all of the choir’s activities that he was elected to a second term until 2007. Choir Registrar, Neil Hall, explained, “I cannot recall a President who, having been elected from ‘outside’ the choir’s ranks, took a more active role than did Gifford. Although he didn’t sing, he even attended out-of-town concerts. Crowning Glory. 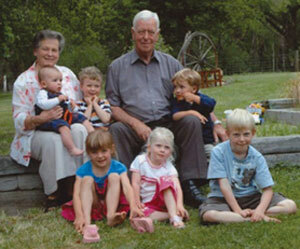 Shirley and Gifford with six of their grandchildren. “His Presidency also extended to include his wife Shirley’s baking skills. For two Christmas concerts our Choir’s funds were swelled with the proceeds from two simply magnificent Christmas cake ‘donations’ which were raffled. Within the magnificent First Church (the site of the Brown family’s new beginning), the men of the choir roused all in attendance. Gifford would have experienced much elation in listening to them. First Church seats 700 and, at 1:30pm on Monday 7th May 2012, there were next to no seats unoccupied - proof enough of a life well lived, and of a man who had meant much to many. Gifford always saw the best in everyone. He was quick to offer encouragement; or help and support when needed. He fully embraced the ethos of Masonry, and really was the epitome of what any Freemason should aspire to be. 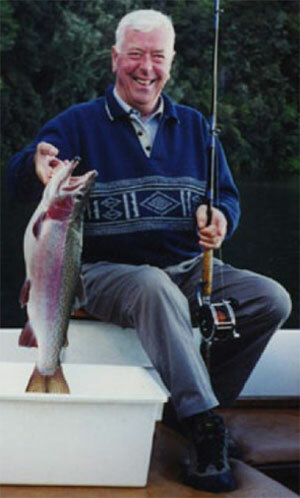 As Sir Robin Gray said of his dear friend, “Gifford Brown was a true gentleman”.